May 2008: The church is on Heritage Canada's 10 most endangered list. See the post below. To read a January 25 David Bly article about those concerns go to this link: http://www.calgaryheritage.org/CHIForum/vi ... .php?t=137. Another David Bly Column from April 20 is below. MCES (Midnapore Church of England Society) hosted a public meeting Saturday Feburary 11th, 2006 at the the Anglican Church hall that sits between the two heritage churches - St. Pat's and its neighbour, the historic Midnapore Church of England. It was well attended by 50-60 individuals. I met descendants of the pioneers, Catholic St. Patrick's parish members, St. Paul's Anglican parish members, Calgary Civic Trust members, representatives of Memorial Gardens, the present owner of the site, a representative of the Bishop and many other interested Calgarians. 1. Sheila Johnston and myself, Ken LaPointe were present from the Calgary Heritage Authority. 2. The original lands were donated to the Catholic Diocese in 3 parts; Nuns donated land for the purposes of a cemetary, and the remaining two parcels donated by pioneer John Glenn. custodian of the building, not the lands. 4. Memorial Garden's desire is to build a mausoleum and upgrade the cemetary site yet little work has been done to maintain property or the condition of the graves. The current land owners are frustrated but appear to be willing to deal with any group that would seek moving of the building and perhaps assist in dealing with the current Bishop. There seems to be no consideration on their part to participate in any preservation on the site. 5. 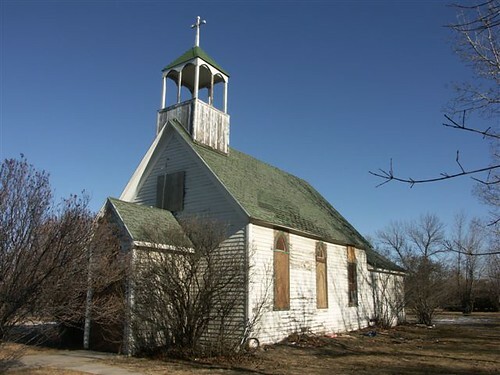 The current historic designation of the lands and church, April 10th, 2001, about 5 years ago, prevents demolition or moving of the church unless approved by the Provincial Minister of Community Development (Gary Mar). Rino Basso was the provincial representative. I have dealt with Rino before and is very approachable and a wealth of information. If the church is to be moved, it must remain in "context". Moving next store might be an alternative (and in "context" but in situ is still the preferred). 6. No structural assessment study has been done (my question during the meeting). Church building's survival. (photo below). 8. Provincial funding through the Alberta Historical Resources Foundation is from VLT (gambling) funds and is not acceptable to the Catholic Diocese (previously well publicized and evident at the meeting). 9. A group trying for years to protect or preserve the church was met with refusal by the previous Bishop Paul O'Byrne. The present Bishop's (Fred Henry's) position is well known regarding heritage matters. A representative of the Bishop (and only an "observer") at the meeting said in their recent discussions that moving of the church to St. Mary's college site was discussed but not moving the church to the Anglican site - that didn't even seem to be considered. 10. The group organizing the meeting, The Midnapore Church of England Society (MCES), formed 11 years ago and responsible for the restoration of St. Paul's Anglican church, would like to assist any new group that would help preserve the lands as a whole and in "context". No objection of moving the Catholic Church to the Anglican site was apparent. It was implied that another interested group should take the lead role and not the MCES. Last edited by Bob van Wegen on Fri May 19, 2006 12:54 pm, edited 6 times in total. The "Old St. Patrick's Preservation Society" is a newly registered non-profit society formed for the purpose of the restoration and preservation of the "Old St. Pat's Church" - between Bannister Road and Macleod Trail in Midnapore. The First General Meeting is being held on May 7 at 2 pm at the 'new' St. Patrick's Catholic Church at 1414 Shawnessy Blvd. SW. The church with the interesting past has hope for the future. A group is being formed with the aim of restoring and preserving the century-old St. Patrick's Catholic Church which sits along Macleod Trail. The church was built in 1905. The legendary Father Albert Lacombe became the first resident parish priest at St. Patrick's in 1909. For years, the old, wooden church has stood empty, and vandals and climate have taken their toll. The dilapidated St. Pat's stands in sharp contrast to St. Paul's, the nearly identical Anglican church a stone's throw to the south. St. Paul's, built in 1885, is a historical gem, neatly painted and well kept, thanks to the Midnapore Church of England Society, which stepped in when the Anglican diocese wanted to sell the property after the church was closed in the 1990s. At the urging of that society, a number of people interested in saving the old Catholic church have decided to form the Old St. Patrick's Preservation Society. "We're applying for society status with the Alberta government," said Michael McGuire, who has taken charge of filing the paperwork for the group, headed by Hugh McKevitt, who is out of town on vacation. McGuire said charitable status from the federal government and a website for the old church are imminent. The move to form a St. Pat's society came after a group of Catholics met with members of the Anglican society a few weeks ago to see what could be done to save the old Catholic church. Clarence Patton was at that meeting. "It was a marvellous meeting," he said. "There was a great mix of Roman Catholics and Anglicans." Patton was the first chairman of the Midnapore Church of England Society, named after the pioneer group that built the original St. Paul's. He has watched with dismay the deterioration of St. Patrick's, which his grandfather helped build. He was one of several Anglicans who urged their Catholic friends to take action to save St. Pat's. He said he's delighted that initial steps have been taken. "I sure hope it comes to be," he said. "Those two churches were born to be together." The land on which St. Pat's sits was sold about 10 years ago to Memorial Gardens Canada, which maintains the cemetery adjacent to the church. The original agreement was that the Catholic diocese, which still owns the building, would move or raze the old church. The diocese applied for a demolition permit in 2000, but that process was halted when the province declared the church a historic site in 2001. McGuire, descended from the McKevitts, one of the pioneering families which helped build St. Patrick's, said the Anglican group has provided encouragement and experience to the St. Patrick's group. "They've been a great, great bunch of people to work with," he said. The Anglican group was aggressive and sometimes combative with the Anglican diocese in its efforts to save St. Paul's, but McGuire said the St. Patrick's group hopes to achieve its goals through co-operation and consultation. "We're working with two governments, two dioceses and a couple of local societies," said McGuire. "I think it's in everyone's interest to come to a resolution. "We want to talk about the solutions and not about the problems past." At the meeting between the Anglicans and Catholics, one plan suggested was to move St. Pat's a few metres south so it would share the St. Paul's property. But McGuire said it would be premature to comment on specific proposals. The Anglican diocese, the Catholic diocese and Memorial Gardens Canada have not yet been consulted, he said. That will happen after the society is fully organized and operating, he said. Catholic Bishop Fred Henry said he's open to proposals for the future of the old church. "If somebody's got some ideas, I'm certainly willing to listen," he said. "I don't see any point in just letting it fall to the ground. If we can do something, I'm all in favour of it." Gary Carmichael, vice-president of media relations for Memorial Gardens Canada, said his company would "welcome dialogue with any group." "I don't think anybody has a preconceived notion of what should happen or not happen," said Carmichael from his Toronto office, "but we are certainly open to discussions with interested parties and the diocese." 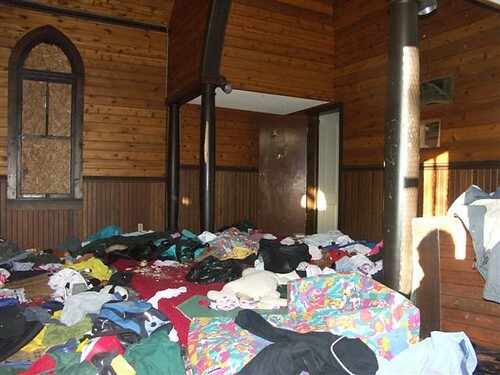 Employees of his company recently cleaned and secured the old church, which had been trashed by vandals. McGuire said the parishioners of the two churches were always good friends and neighbours, regardless of religion. "It didn't matter to them which side of the Reformation you came from," he said. The supporters of old St. Patrick's have tapped into that same spirit. Patton said the Anglicans are ready to help their Catholic friends succeed in restoring and preserving the old church. And he's certain they will succeed. "There seems to be a groundswell to protect structures like St. Pat's that wasn't around years ago," he said. Does anyone have an update on the situation with St. Patricks? I have visited the website a few times but nothing new there. St. Pat's Group still at work! Just a quick update. I have been in contact with a member of this group for several months now (I have done their new web page for them). I don't know many details but these folks are still working on this project and I'm sure they will be successful! Re: "Buildings gain historic designation," Feb. 5. The city's land use planning and transportation committee is to be congratulated for its efforts to grant historical status to the 1914 St. Louis Hotel and its beloved beer parlour, thus honouring Col. James Walker, who was responsible for its construction. It would also be commendable if this committee would direct its attention to the St. Patrick's Church in Midnapore, built in 1905, which is in desperate need of restoration. Father Albert Lacombe's contribution to our history deserves recognition as well. Hugh McKevitt had no idea how hard it would be to preserve the church. He grew up attending Old St. Patrick's, founded in 1905 and located just off Macleod Trail. But the church has been empty for years (last holding services in the early 1980s, McKevitt believes) and fell into decay. It had become the victim of vandalism; pockmarked with graffiti, its woodwork virtually destroyed. Now, Old St. Patrick's, a provincial heritage site, has garnered a dubious distinction. It ranks among the top 10 endangered places in Canada, according to the 2008 list compiled by the Heritage Canada Foundation, a non-profit organization seeking to preserve historic buildings and places across Canada. Two years ago, McKevitt and a small group of people with close ties to the church founded the Old St. Patrick's Preservation Society. Their goal: give the church a new coat of paint, repair the roof and do some restoration. That hasn't happened, and little has changed in the past two years, aside from some added security. "It turned out to be a much bigger challenge than we expected," said McKevitt, who remembers a time when each family sat in the same place every Sunday in the church, which seats approximately 75. The issue, McKevitt said, is the church is owned by Memorial Gardens Canada, a subsidiary of Arbor Memorial Services. McKevitt said the funeral service company has not allowed preservation society members to restore the church due to liability issues. The company's vice-president acknowledged Thursday that liability is one of the concerns. Gary Carmichael said Arbor bought the property in the mid-1990s from the Catholic Diocese. The church was supposed to be removed by the diocese, but that didn't happen. Now, Carmichael said, the company is in preliminary discussions with the diocese about simply returning Old St. Patrick's to the diocese. Meanwhile, a spokeswoman with the Heritage Canada Foundation said preservation of such buildings must take priority. "Too many historic places in Canada have been in a state of siege," Carolyn Quinn said. She said there is economic value in keeping heritage buildings. Residents are more interested in moving to communities with older buildings, they provide character, and tourists are also more interested, she said. Synagogue is safe; now what about St. Patrick's? Re: "Little synagogue begins new life," June 28. Congratulations to all those responsible for the saving and restoration of this priceless icon of Alberta's rich history. It is wonderful that this little 1916 synagogue will find a peaceful home at Heritage Park. Why isn't it possible to arrange for a similar restoration and relocation to Heritage Park of the 1905 St. Patrick's Church in Midnapore? This poor, derelict church needs to be rescued before it is destroyed by vandalism. There is a Facebook page for Old St. Pat's. What's the latest news with this? Does anyone know? St. Patrick's Church was legally protected by the Province of Alberta as a designated Provincial Historic Resource on October 4th, 2001. "Owners of Provincial Historic Resources are obligated under the Historical Resources Act to be good stewards of their heritage properties. No person can destroy, disturb, alter, restore, repair or remove any historic objects from a Provincial Historic Resource without approval in writing from the Minister of Culture and Community Spirit." To hear the latest update on Old St. Pat's come to the Heritage Roundtable on March 17 (St. Patrick's Day!) in the John Dutton Theatre at Central Library. Doors Open at 6:30 and meeting starts at 7pm. Just wanted to update everyone, but something is happening at the Old Saint Pat's church. This week I've spotted multiple cars parked outside and yesterday a dumpster appeared. The north facing side of the building has had the plywood removed from the top windows and they are now covered in plastic, as is the round window over the front door. Not sure if someone is fixing it up or tearing it down. Have yet to be able to corner any of the workers to see whats happening. After years in limbo, Old St. Pat's came back under the ownership of the Roman Catholic Diocese earlier this year. The latest news is that the RC Diocese of Calgary has entered into an agreement with a Russian Orthodox parish in Calgary to lease St. Patrick’s Church. "The Russian Orthodox parish has been in discussions with our department and is very keen to begin work on restoring the building," according to Matthew Wangler, Manager, Historic Places Research and Designation Program, Alberta Culture and Community Spirit, Historic Resources Management Branch. If anyone out there has further news, please post.